Text: Based on the leaves we have seen, this Book of Hours accords with the Use of Rome (see Leaf 36 in the Cleveland Public Library portfolio, which contains the "Dum Esset" antiphon). 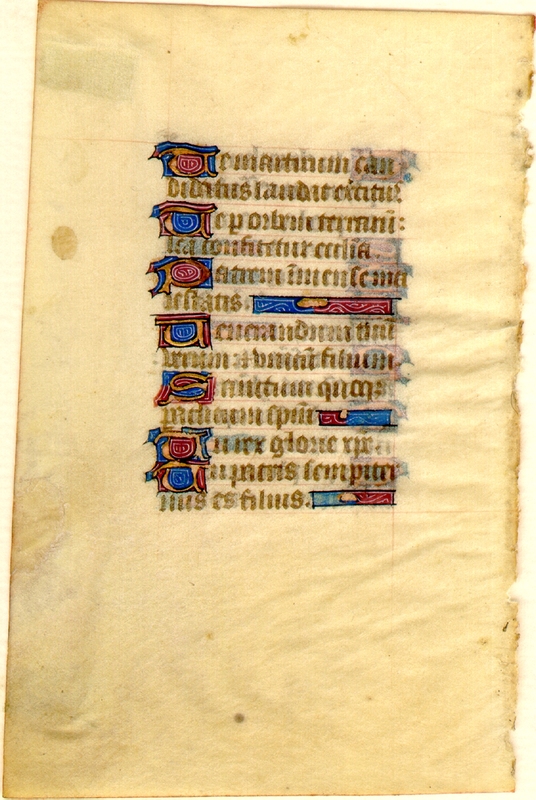 This leaf contains text from the Hours of the Virgin at Matins; here, continuing the Hymn of Saints Ambrose and Augustine (i.e., the Te Deum). A scan of the recto is not currently available. Reconstruction Note! In Ege's original manuscript, this leaf followed what is now Leaf 36 in the Cincinnati Public Library portfolio. Te per orbem terrarum sancta confitetur Ecclesia. Venerandum tuum verum: et unicum filium. Thee the white clothed army of martyrs, doth praise. Thee the holy Church through the world doth confess. Thy venerable true: and only son. And also the Holy Ghost the comforter. Thou O Christ the king of glory.